The Town Council will install a seat dedicated to the memory of a loved one, or as a tribute to an event or organisation, for a charge of £750 (2012/13 prices) for a wooden seat, £1,000 for a 1.8m serpent head seat and £1,250 for a 2.3m serpent head seat. The cost covers purchase, installation, maintenance for ten years and a dedication plaque. 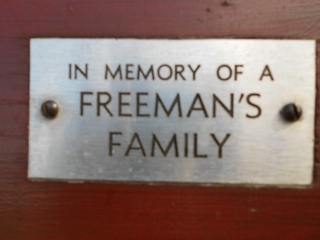 An existing seat can be refurbished, and a plaque added, at a cost of £500. The seat may be re-located to another site if appropriate. (Please note that the maintenance includes the timber, but where a serpent's tail is missing this will not normally be replaced owing to cost). The seat can be installed at an agreed location in the town displaying a brass plaque with an appropriate message. At the end of 10 years the seat can be renewed or the plaque will be removed and returned to the applicant. Any plaques unclaimed will be placed on a living memorial seat located in Berwick. For an application form click here. After completion please return to the Town Council office, 5 The Chandlery, Quayside, Berwick-upon-Tweed, TD15 1HE.